According to the reigning narrative in Boston these days, the entire Obama campaign has been built on a miscalculation: Team Obama believed the way to win was to cast Mitt Romney as a soulless plutocrat; it spent hundreds of millions of dollars and hundreds of thousands of man-hours driving that point home. But the only thing all that spending and mau-mauing brought them was a caricature of Romney so fragile it promptly collapsed when the country finally got a look at who he really was. “[Romney] wiped out millions of dollars in attack ads portraying Mitt Romney as a rich guy from Bain Capital,” John McCain said of the debates, channeling the view from Romneyland. There’s clearly something to this storyline, at least judging from October’s polls. As recently as late September, Americans' unfavorable views of Romney outweighed their favorable views of him by 4-5 percentage points. Today, more people view him favorably than unfavorably. If Obama loses on Tuesday, Democrats will be right to wonder if Chicago made the wrong call on the biggest strategic question it faced. But ever since the Denver debate, where Republicans first conjured up this story, it has suffered from a potentially devastating flaw: Ohio. Even as Obama’s lead shriveled in other key states, like Florida and Virginia, the losses were smaller in Ohio, where his margin was larger to begin with. The RealClearPolitics polling average, the choice barometer of Republicans, shows Obama coughing up 5.2 percentage points in Virginia since his September peak and 4.4 points in Florida, but only 3.3 in Ohio. Ohio is the only one of the three where RCP shows Obama ahead as of this writing. What explains this? It would seem to be that most exotic of political specimens, the working-class Ohio voter. It’s not too much of an exaggeration to say that the Obama strategy wasn’t designed to win states like Florida and Virginia, which would have produced an Electoral College wipe-out. It was designed to secure just enough votes to eke out a victory (perhaps with a small cushion). And to do that, the only swing state the campaign really needed to focus on was Ohio, which Obama carried by 4 points in 2008 (compared with the 7 points by which he trumped John McCain nationally). If you started with the premise that only Ohio really mattered, then factored in the auto bailout, one of Obama’s greatest successes, and private equity, one of Romney’s biggest liabilities, it wasn’t hard to see that limiting losses among Ohio’s working-class voters was Obama’s most promising path. (Only 24 percent of Ohioans have a college degree, versus 26 percent of Floridians and 34 percent of Virginians.) In particular, it would be his best bet for keeping that 4-point Ohio margin in positive territory even if his national vote-margin shrank by more than 4 points, as was highly likely. And so Team Obama bombarded the state with ads painting Mitt Romney as the sort of guy who would shutter your factory for kicks. The Obama folks did this early on in the campaign, and they didn't let up. What the latest polling data suggest is that, even as Romney managed to shed his Monty Burns image in other parts of the country, it’s still dogging him across Ohio. In late September, when Obama’s leads were at their most commanding, a Quinnipiac poll put him up 9 points in Florida and 10 points in Ohio. When Quinnipiac released another poll this week, it showed Obama essentially tied in Florida (up 1), while riding a 5-point lead in Ohio. As it happens, working class voters seem to explain much of the difference between the two states. Among people with no college degree in Florida, Obama went from leading by 11 to down 2—a net 13-point loss. But in Ohio, the story couldn’t be more different. There, Obama had an 11-point lead among non-college grads in September; he has a nearly identical 10-point lead among the same group today. The results are even starker among the white working class. In Florida, Obama plummeted from an 8-point deficit to a 27-point deficit among whites with no college degree. In Ohio, by contrast, he held almost perfectly steady: a 3-point deficit in September versus a 2-point deficit this week. (Obama carried Ohio voters without a college degree by a 52-46 margin in 2008, and lost whites without a college degree 44-54.) Though it's only one poll*, and the data shouldn't be interpreted too literally, the Obama strategy seems to have worked as intended. 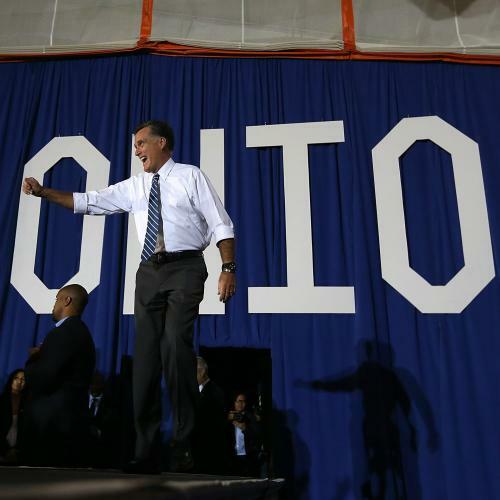 If, as the polling averages anticipate, Obama carries Ohio on Tuesday (and, in effect, the election), it will be Romney who made a colossal miscalculation in the end, not Obama. Team Romney believed most voters would eventually dismiss the plutocrat portrayal of their candidate, and so they didn’t spend much time refuting it. And they were right—most voters did dismiss that portrayal. What the Romney folks missed was that Obama didn’t need to sell the portrayal to most voters. He just needed to sell it to several hundred-thousand Ohioans. And he appears to have succeeded. *Note: I use Quinnipiac here not because I have any special affection for that outfit. But because it's pretty much the only one that polls Ohio regularly and releases crosstabs detailed enough to consider the kind of question I’m considering here. A lot of Republicans complain that Quinnipiac skews Democratic, which is true. But that shouldn’t matter since I’m only looking at the change from one poll to the next, not using the numbers to evaluate the state of the race in some absolute sense. The bigger problem is that the sub-samples of voters aren't super large--probably in the neighborhood of 500 for people without a college degree, less than that for whites without a college degree. But they should be large enough to reflect broad shifts even if we should be careful about reading too much into specific numbers.